Jackson Bird is a tall right arm pace bowler from Australia. He bowls into the wicket at a reasonable (if not express) pace, and bowls consistently in good areas. He moves the ball both in the air and off the seam. I had the privilege to watch him make his test debut, and he looked like a very good prospect. He was the top wicket taker in the Sheffield Shield in 2011/12 with 53 wickets and was high up the table again in 2012/13 despite only playing in 6 matches. 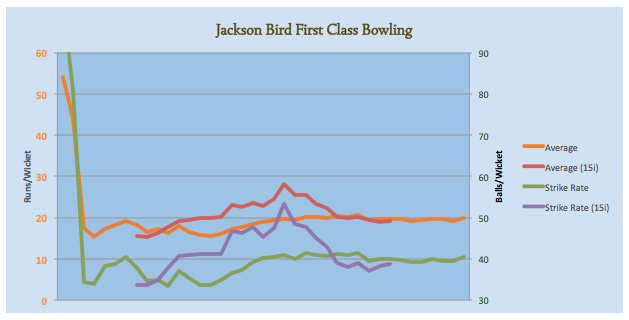 He did all this at with a very good average and strike rate. Part of those good figures is due to playing for Tasmania, and hence getting to play half his cricket on the Bellerive Oval, where he has taken 42 wickets at 16.19. However there are only 3 grounds where he averages more than 30 at, and at all of these he has only played one match. It is the nature of medium-fast bowlers to be quite reliant on the pitch, and Bird has not found the going quite as easy in the matches he's played in England for either Australia A or the Australians. The purple and red lines are 15 innings rolling averages. Throughout his career so far, there's only been one 15 innings period where his average has gone above 26. His career average is currently quite settled at about 20 and his career strike rate is settled at about 40. Those are extraordinary numbers. When he ran in to bowl, he looks a little like Charl Langeveldt at first, but the he opens up and his delivery stride is reminiscent of another tall medium-fast bowler hailing from New South Wales, Glenn McGrath. The interesting thing to note here is that McGrath's average and strike rate are consistently higher than Bird's at the same stage in their respective careers. Bird's lines are almost all in the bottom two bars, while McGrath's are mostly in the middle two bars. 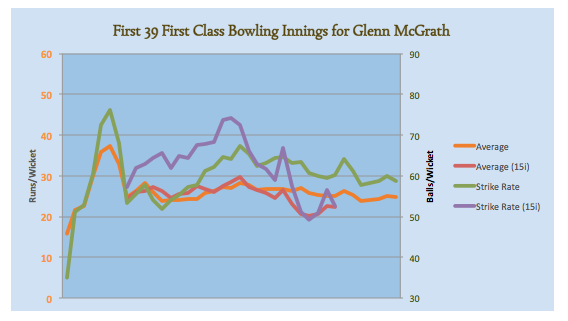 McGrath's best strike rate in any 15 innings period at the start of his career was about the same as Bird's worst. That's not to say that Bird is going to be better than McGrath, the standard of batting in Australian domestic cricket when McGrath debuted was phenomenal, particularly in comparison to now, but it is promising. If he gets a bowl at the English in the Ashes, it will be very interesting to see how he goes. Interestingly Gurinder Sandhu has a bowling average of 14 at the age of 26. Looking forward to seeing him in action for Australia alongside Cummins in the next English Ashes series. Sandhu is a name that I have heard some talk about, but he's actually quite a bit younger than you suggest (just turned 20) and has only played 3 matches, so his average is not yet quite as meaningful as Bird's. Still he looks like a reasonable talent.